Estelle Richman is Confirmed by the PA Senate — Time to Abolish the SRC! After months of delay by the Pennsylvania legislature, Estelle Richman has been confirmed for the 5-person unelected School Reform Commission. The delay in confirming Ms. Richman is nothing new from the Pennsylvania legislature. Since the state took away the local governing power of the Philadelphia schools 15 years ago and put into place the School Reform Commission, we have seen the state fail our schools, our kids, our teachers and our parents. The School Reform Commission has deliberately targeted school closures in Black and Brown neighborhoods, cancelled the teachers’ contract, and opened the gates for unaccountable expansion of charter schools. Today, Mayor Kenney named Joyce Wilkerson to a position with the School Reform Commission (SRC). Wilkerson is the second appointment to the SRC this month, replacing Marjorie Neff who resigned in September. Recently, Governor Wolf named Estelle Richman as his nominee to the SRC, replacing Feather Houstoun. In January, a third SRC position will be open when Sylvia Simms’ term is up. In response, members of the Our City Our Schools coalition called on Mayor Kenney and Governor Wolf to appoint members to the School Reform Commission ready to vote to abolish the School Reform Commission — and return the Philadelphia schools to local control. “Estelle Richman has a long history of public service and is certainly a strong choice from Governor Wolf. But there are clear questions that need to be asked of all appointments put forth for the School Reform Commission. Does former secretary Richman support local control of Philadelphia’s schools? Will former secretary Richman commit to vote to abolish the School Reform Commission should she become a commissioner? These are the questions that our Governor and our Mayor should be asking as they choose commissioners. In May 2015, Philadelphia residents made their opinions very clear when over 75% of voters voiced no confidence in the SRC. Will Governor Wolf and Mayor Kenney listen to their constituents? Our City Our Schools is a campaign led by parents, teachers, students and community, faith and union leaders, calling for the abolition of the School Reform Commission and for local control of Philly’s schools. Endorsing organizations include: Taxi Workers Alliance, Philadelphia NAACP, 215 People’s Alliance, Philly Student Union, UNITE HERE Local 634, Parents United for Public Education, Reclaim Philly, AFT Local 2026, Teacher Action Group, Caucus of Working Educators, APPS, Neighborhood Networks and Media Mobilizing Project. 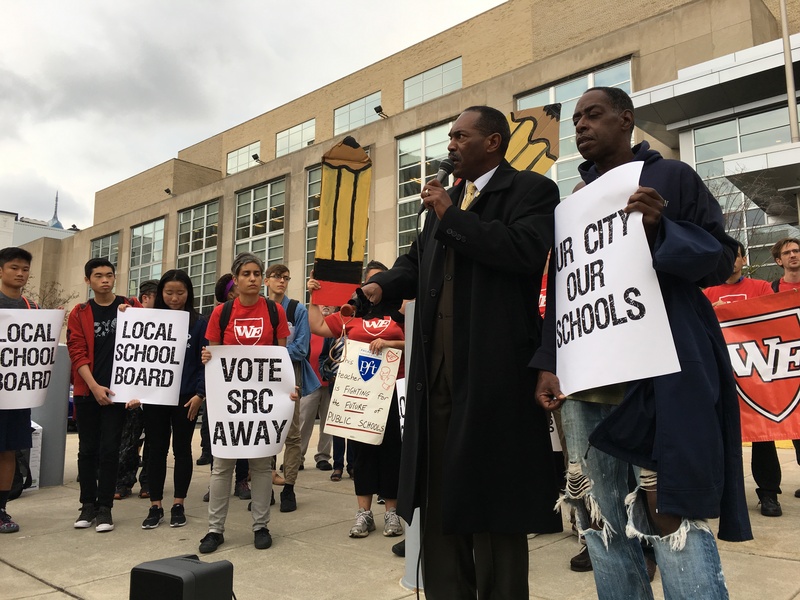 PHILADELPHIA — Recognizing a growing community-labor alliance around abolishing the School Reform Commission, Councilmembers Darrell Clarke, Jannie Blackwell, Helen Gym and Blondell Reynolds-Brown released an editorial calling for abolishment of the SRC in favor of local control. Mayor Kenney released a statement that said that local control was “not practical” at this time. Two SRC Commissioners Resign — Our City Our Schools Responds! Today, Marjorie Neff and Feather Houstoun announced their resignations as members of the 5-person School Reform Commission. As a result, only three members will remain on the School Reform Commission. It is unclear if the SRC now has quorum in order to make decisions on the governance of the Philadelphia schools.